Accor-Ambassador hotels in Seoul: Novotel Ambassador Doksan and Ibis Ambassador Seoul present special summer health Chicken Soup menu. The chicken soup has been one of the people's favorite summer delicacies as it has efficacy on surviving the summer heat. This wonderful dish is gradually being recognized by the rest of the world. Korean Restaurant ‘Yura' at Novotel Ambassador Doksan adds ‘Wild Ginseng Chicken Soup' to its menu to help you survive the sizzling summer heat. The special dish is featuring artificially grown ginseng, rice, nuts, jujubes, gingko nuts, pine nuts, mung beans and a lot more. This special Chicken Soup, known as the best summer health delicacy, helps regain stamina, enhance vitality, prevent aging, stimulate appetite and discharge phlegm. 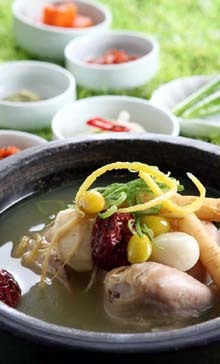 Come to Yura and find your new summer appetite with our special Wild Ginseng Chicken Soup. Chicken Soup and survive the summer heat!